More than ninety thousand fortune-seekers swarmed to California when gold was discovered at Sutter’s Fort in 1848. In order to reach San Francisco, half these gold seekers braved a grueling, eighteen-thousand-nautical-mile voyage around the tip of South America. In the process, many left their wits behind. 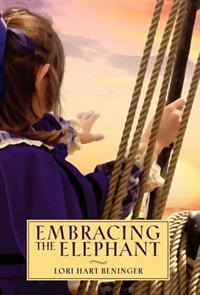 Embracing the Elephant, a middle-grade, coming-of-age tale, chronicles the journey of motherless eleven-year-old Guinevere Walker by sea and land in 1848-1849, as she seeks to reunite with her father in the untamed town of San Francisco. The cover illustration of a young girl aboard ship reaching toward the lighted horizon is a perfect invitation to young Guine’s story. Shepherded by stuffy Reverend Dunsford and his family, Guine travels aboard The Pelican from civilized Boston around Cape Horn to wild San Francisco. But, her father is not there to greet her; instead, she finds a letter: “To be quite blunt, my sweet girl, you cannot live with me in the conditions in which I find myself. My home is a tent at the side of a fast-moving creek, surrounded by trees and grizzly bears, mountain lions and Indians.” As her trek continues, Guine learns hard lessons about trust and betrayal, ultimately discovering that she is her own best bet for survival. Lori Hart Beninger’s first novel, Embracing the Elephant is capably written, populated with well-developed characters, and thoroughly researched. The author frequently instructs readers on subjects including seamanship, ports of call, flora and fauna, the Gold Rush, and the history of the Mexican-American treaty through which California became a US possession. These details add to the book’s rich educational focus. Younger readers may struggle with the antiquated language of Guine’s first-person account. She says, for example, “Tempted at first to deny my absence, I demurred,” and, “I envision the Reverend … bursting in to admonish me,” and “I do not want … [to] be reminded of my transgression.” Guine’s language, however, is both historically accurate and appropriate for a precocious and well-read child of eleven. As such, it should appeal to mature middle-grade bibliophiles. Readers who do not require a plot bursting with action will appreciate the more leisurely pace of nineteenth century-style storytelling that characterizes Beninger’s book. And, Guine’s plucky personality will appeal to booklovers who value a heroine with backbone. The odyssey Guinevere Walker narrates in Embracing the Elephant is long and arduous. But, it is a journey worth taking.